Riding on unfathomable volumes of industrial expertise, we are providing a broad array of Thermoelectric Peltier Refrigeration System Cooler Fan. • It used in communications equipment, security surveillance, ATM's, panel cooling. Most electronic cabinets of electronic control systems generate substantial amount of heat during operations. More problems occur when such electronic cabinets are placed in dirty, humid and hot factory shop floor, rather than in clean room. - We offer an exclusive range of Panel AC / Flame Proof Air-Conditioner as per client require. Fabricated using superior quality raw material and offered as per the customized needs, these air conditioners are appreciated for their longer functional life and power efficiency. Panel AC / Flame Proof Air-Conditioner is provided to our clients at cost-effective pricing. Panel Air conditioners are designed to be used in electrical & electronic panels. They aesthetically integrate into the assembly to maintain temperature stability and control as well as dust & humidity protection, for normal operation of sensitive electronic equipment without unwanted interruption. Yadnya Engineering India Pvt. Ltd.
we are manufacturer of 230 V AC Side Mount Panel . 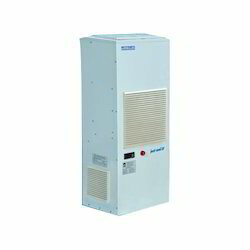 Being a quality oriented organization; we offer our wide range of Panel Air Conditioner, which is finely processed using high grade techniques. We assure that our clients remain satisfied from our qualitative product range. 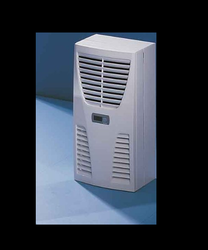 Our offered ranges of Panel Air Conditioner are precisely designed and engineered by the team of experts.